Nearly 425 Doe Run employees spend their work day approximately 1,200 feet underground. For some, the comfortable 65-degree temperature makes for a perfect work environment. Those who go underground for the first time are often surprised at how vast and open our mines are. 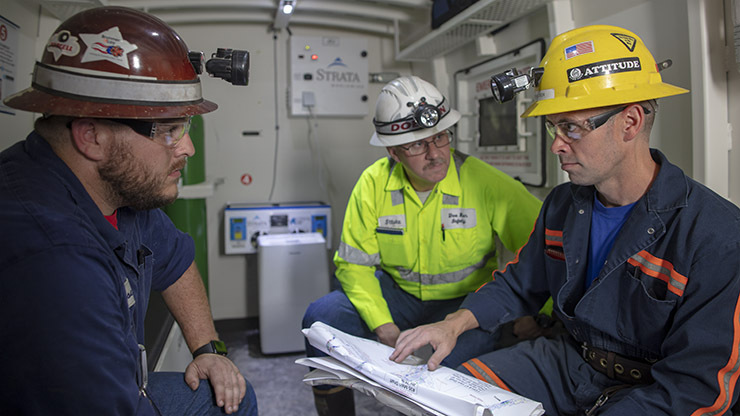 Doe Run works to stay ahead of safety risks and underground mine safety requirements by investing in the next generation of underground mine safety technologies. Doe Run’s underground metal mines have earned 28 Sentinels of Safety Awards, the highest honor for underground mine safety performance. The National Mining Association presented this award to Buick Mine and Mill in 2017. While underground fires in metallic mines, like Doe Run’s mines, are unusual (since our ore does not burn and methane gas is not a byproduct in metallic mines), it is possible for heavy mobile equipment, such as haul trucks and front-end loaders, to overheat underground. In 2017, Doe Run added new, onboard fire suppression systems to use in the event of equipment fires. Each vehicle with a fire suppression system also has a backup fire extinguisher. In addition, each Doe Run mine is equipped with a fire cart. Doe Run mine rescue teams can use a fire cart to pump 250 gallons of water and fire-retardant foam in the event the onboard system does not extinguish an equipment fire. Read more about Doe Run’s mine rescue teams here. Inside safety chambers, employees have access to food, water, oxygen and other essentials. In the event of an underground equipment fire or other emergency requiring sheltering in place, employees can take refuge in underground safety chambers. In 2017, Doe Run spent $640,000 to install the first eight of 30 planned underground safety chambers. “Our existing safety chambers had a good track-record of protecting employees in the unlikely event of an incident underground. 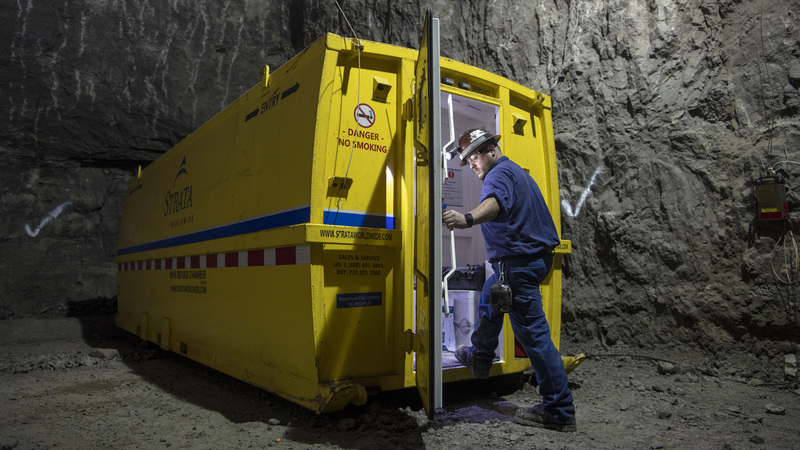 “These new, steel chambers are the size of a truck trailer, and include all the supplies miners need in the event they have to shelter underground for a period.” said Jason. Like our previous safety chambers, these new facilities are equipped with water, oxygen tanks, first aid kits, tools, lights and filtered air. The new shelters also include food, benches and a toilet. The shelters are connected to mine power, and can run on batteries for 48 hours if mine power is lost. Wired phone lines let employees communicate with team members aboveground, and gas detectors monitor air quality. A member of the mine rescue team thoroughly inspects supplies and gas detectors monthly. As the new chambers come off the production line, they are installed in our mines. A total of 30 chambers will be in place by the end of 2020, at an investment of $2.4 million.